You are currently browsing articles tagged BC wineries. 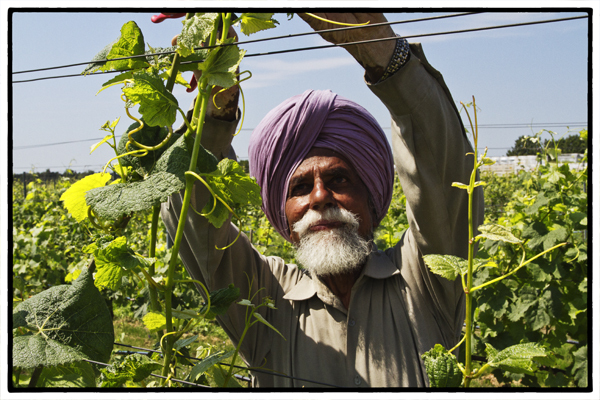 A Sikh pruning vines at Lulu Island Winery in Richmond. Photo by David Lansing. Look at this photo. Where are we? We’re at a winery in Richmond, British Columbia. And out in the vineyard are half a dozen Sikhs pruning grape vines. I told you on Saturday that Laura and I had gone down Richmond’s “Highway to Heaven” where, before we stopped in at a Buddhist Temple, we saw, all side by side, a mosque and a synagogue and several temples, including a Sikh one. Well, evidently the Sikhs head down the highway to work at Lulu Island Winery. I love that! Although I’m not sure if there’s a bit of a conflict there since Sikhs aren’t supposed to use alcohol or drugs. But maybe it’s okay to help make the alcohol—just as long as you don’t sample it. If there are any Sikhs out there reading this please let me know because, frankly, I’m kind of clueless about Sikhs. All I really know about them is that they wear turbans, aren’t supposed to cut their hair, and they make love to Juliette Binoche (at least in The English Patient). I should know more. Particularly since there are over 30 million Sikhs world-wide and they’re the fifth-largest organized religion in the world (and one of the most steadily growing—Wikipedia). So now I know one more thing about them: They’re good workers.